Garden Fertilizer Injector – Feed While You Water! It’s no secret that the plants in your vegetable garden need some combination of nitrogen, phosphorous and potassium (NPK) to thrive and produce to their full potential. Adding compost as a soil amendment before planting can definitely provide most of these required nutrients, but some crops will need additional fertilization throughout their growing cycle. Vegetable garden crops that can be enhanced by additional fertilization include tomatoes, peppers, eggplant and corn just to name a few. 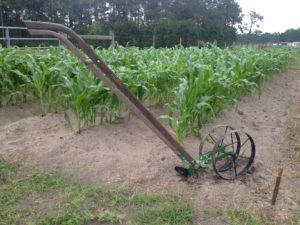 While there are many ways to administer fertilize to the plants in your vegetable garden, we have found that a garden fertilizer injector is by far the easiest and most effective. A garden fertilizer injector allows you to inject soluble fertilizer into your water supply so that you provide nutrients to your plants while watering them, saving you time and energy in your vegetable garden. 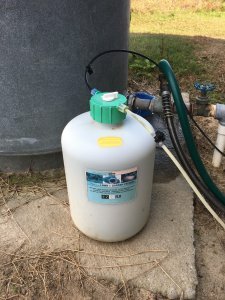 The dissolved fertilizer is injected through the water source at a controlled rate, so that you’re able to administer it accurately and effectively. When used in combination with a drip irrigation system, you can administer fertilizer directly to the plant roots. This conserves fertilizer by only applying the fertilizer to areas of your garden where the plants can absorb it. Our EZ-FLO Garden Fertilizer Injector is the best way we’ve found to fertilize our vegetable gardens! It has a heavy-duty, polyethylene tank that won’t cave in high pressure conditions. It can be easily attached to any standard water hose either at the faucet or between two connecting hoses. Simply add your water soluble fertilizer to the tank, select the application ratio setting on the tank lid, and you’re ready to fertilize while you water! It works great with the conventional 20-20-20 fertilizer blend used by many, but it also effectively administers fish emulsion for the organic farmer. Maximize the potential of your vegetable garden by providing all the right nutrients in all the right places!